I’m a college student with no access to children to test drive these books, but these books let me take a break and be a kid again for a bit. I have always been an avid reader of children’s books, and sometimes their simplicity is exactly the relaxing break I need. When these books came in the mail a week into classes, I wasn’t sure if I was glad or disappointed that they weren’t my math textbook, but they were certainly more entertaining. I had tea-and-Hanukkah-books time with a friend, and we read them aloud to each other. Hanukkah books have never been my favorite, because they so frequently portray Hanukkah as the Jewish counterpart to Christmas. These books break that trend, and, on top of that, are quite fun to read. In my opinion, a good Hanukkah story treats Hanukkah the same as any other holiday, emphasizing aspects other than gift giving, and would hold its own as a good book were Hanukkah removed. 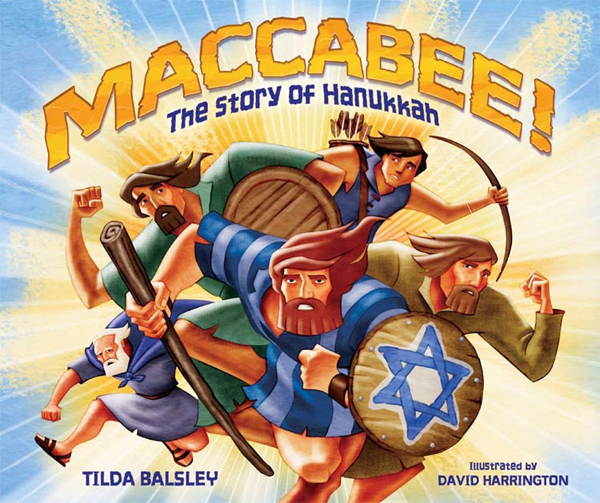 Maccabee! (recommended for ages 3-8) is a beautifully illustrated rendition of the Hanukkah story, and I spent a long time exploring its richly colored pictures. The story is told in verse, at a relaxed pace that allows us to stop and appreciate the illustrations. The book introduces the world of the Jews under the rule of Antiochus, and, shortly thereafter, Judah, who will do what’s right to save the Jews from ruin. When there is trouble, he steps up to fix it, following a refrain of, “Sometimes it only takes a few, who know what’s right, and do it, too.” I have always known the Hanukkah story, but I’ve never felt like I understood how the people involved were feeling. This book gives reasons for the Jews’ decisions in language we can understand. There is little emphasis on current celebration of the holiday except to tie the Hanukkah story to the present day, which is fine with me. Traditions we learn by doing (or reading some of the other books I was sent), and the story will be best learned by reading a book like this one. 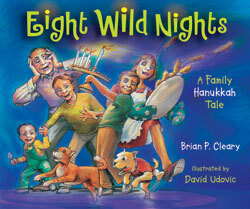 Eight Wild Nights (ages 5-10) carries us through the ups and downs of a big family Hanukkah, and would be fun to read all through the year. The rhythm is quick and the rhymes are silly, so once you start, there’s no way you’ll stop until you reach the end. The book mentions various aspects of Hanukkah in passing, then replaces dreidel with poker and eight days of oil with eight days of toilet paper, so you’ll probably need to be able to explain the Hanukkah traditions as those less famliar with the holiday will likely ask questions. Nathan Blows Out the Hanukkah Candles (ages 5-9) is, refreshingly, more about life than about Hanukkah. There is mention of various aspects of the holiday, but it is really about the relationship between the narrator, Jacob, and his autistic brother, Nathan. 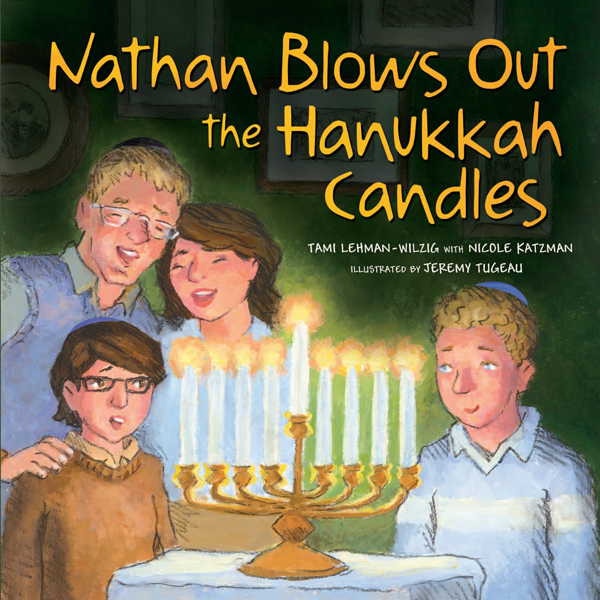 Jacob worries that Nathan will embarrass him in front of a new friend, and Nathan indeed does so by blowing out the candles in the menorah, something not part of the Hanukkah ritual. Blowing out the candles is then made into a new tradition. My favorite part is that the story is based on a real Nathan, the child of one of the authors, who did indeed blow the Hanukkah candles out. The creation of new traditions should be particularly appropriate for interfaith families, and the theme of accepting everyone is always welcome. 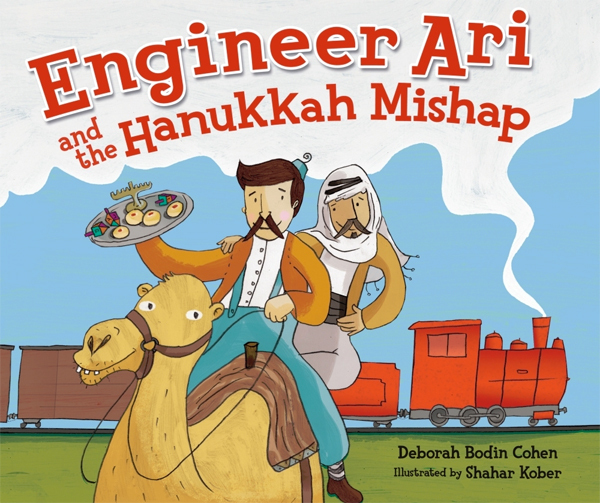 Engineer Ari and the Hanukkah Mishap (ages 5-9) takes us on a train ride through Israel with a Hanukkah theme. We hear little bits of the Hanukkah story from children along the way as Engineer Ari travels from Jerusalem to Jaffa. He manages to derail his train right in Modi’in, the ancient home of the Maccabees. There he meets Kalil, a Bedouin man with whom he shares Hanukkah. Ari shows Kalil how he celebrates Hanukkah, and he gains a friend as well. This book is appealing for an interfaith family: it is about sharing the Hanukkah traditions with everyone, even when they’re not Jewish. 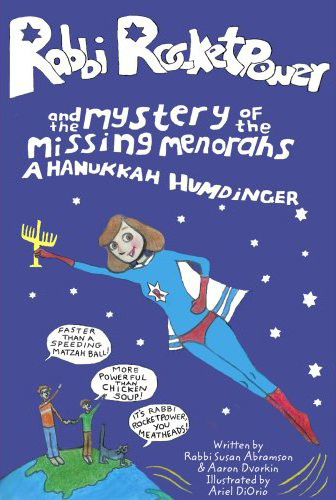 The story isn’t very cohesive, but it includes many good pieces of a Hanukkah story, and is fun to read. Again, knowing the Hanukkah story is useful here, because it’s only told in bits and pieces. Rabbi Rocketpower and The Mystery of the Missing Menorahs (“For Grades 1 – Katrillion”) follows a superhero family where the mother is Rabbi Rocketpower, the father is a computer expert, their kid is a Super-Boy-in-Training, and their cat seems like an ornery additional child. The book is written by a real-life rabbi and illustrated by a high school student, and although it is not a comic book, it has a similar feel. The pages are peppered with pictures, and the action is non-stop. The story of Hanukkah stars king Antiochus in cat form, and later some confused aliens are found to have stolen the menorahs. This book is of the variety that kids find engaging, but won’t really have the same entertainment value for adults. But for adults we have the requisite Hanukkah recipes at the end, not to be attempted by children without supervision. There is also an explanation of how to play dreidel, pointing toward this as a good book to read to a group of children with the intent to occupy them for quite a while, even after the reading is done.